Many of you have read and loved our Walnut Buddy Tip from yesteryear which is why we bring you this tip. 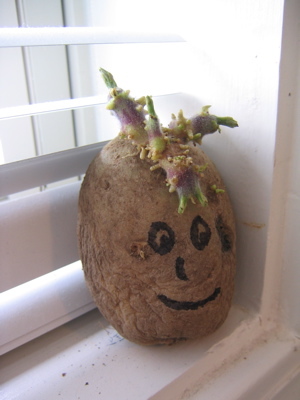 If you want to have a guaranteed smile every time you approach your kitchen window, simply take a small, shriveled, dried-up potato with a scary sprouting head-adornment like this little guy and place a smiley face on him using a Sharpie. When others let you down, this little guy will not. You'll always come home to his face smiling. And thanks to the Potato Blight™ it should be easy to find under-sized (but perfectly sized for our little venture) potatoes everywhere from Wal-Mart to Kroger. Sure, dogs will always give you love and affection and will never be mad at you, but our potato friend won't pee on your carpet. It's the perfect pet! LOL, my co-workers demanded I tell them what I was laughing about. And now they are disturbed, dismayed, and think I am the strangest person they have ever met.